The United Nations chief, Antonio Guterres, says he is leaving Libya with “heavy heart and deep concern”, after holding a meeting with renegade General Khalifa Haftar who has ordered his troops to march to the capital. Armed clashes took place on Friday near Tripoli as eastern forces loyal to Haftar continued their advance towards the city, home to the country’s UN-backed Government of National Accord (GNA). “I still hope it is possible to avoid a bloody confrontation in and around Tripoli,” Guterres wrote on Twitter, as he wrapped up a visit to the North African country that saw him making a diplomatic dash to Libya’s rival centres of powers. Guterres had travelled to Libya this week to help organise a national reconciliation conference planned for later this month and aimed at drawing a plan for delayed elections. Amid mounting fears of a renewed civil war, Guterres on Thursday met GNA head Fayez al-Serraj in Tripoli, before heading on Friday to the eastern city of Benghazi, Haftar’s stronghold. According to Al-Arabiya TV, Haftar told Guterres that his operation towards Tripoli will continue until “terrorism” has been defeated. The UN Security Council scheduled an emergency closed-door meeting on Friday afternoon at the United Kingdom‘s request to discuss the dramatic escalation in Libya’s years-long power struggle. Since the NATO-backed removal of long-time ruler Muammar Gaddafi in 2011, Libya has been split between rival governments in the west and east – the GNA in Tripoli and the House of Representatives in Tobruk, respectively – and an array of militias fighting over power and oil fields. Haftar’s LNA troops on Thursday took the town of Gharyan, about 100km south of Tripoli, putting them closer than ever before to militias allied to the GNA. Earlier on Friday, LNA forces failed to take a checkpoint about 30km west of the capital. They were pushed back by pro-GNA militiamen from the coastal town of Zawiya after a “short exchange of fire”, AFP news agency reported, citing an unnamed security source. In another setback, forces allied to the GNA took 145 LNA fighters prisoner in Zawiya, a western commander, Mohamed Alhudairi, told Reuters. An LNA source confirmed 128 had been captured. This came after militias in western Libya vowed to confront Haftar’s attempt to seize Tripoli. Al Jazeera’s Mahmoud Abdelwahed, reporting from the capital, said that forces from Misrata are also believed to have joined Tripoli-allied troops to the south of the capital and are advancing southwest towards Gharyan. 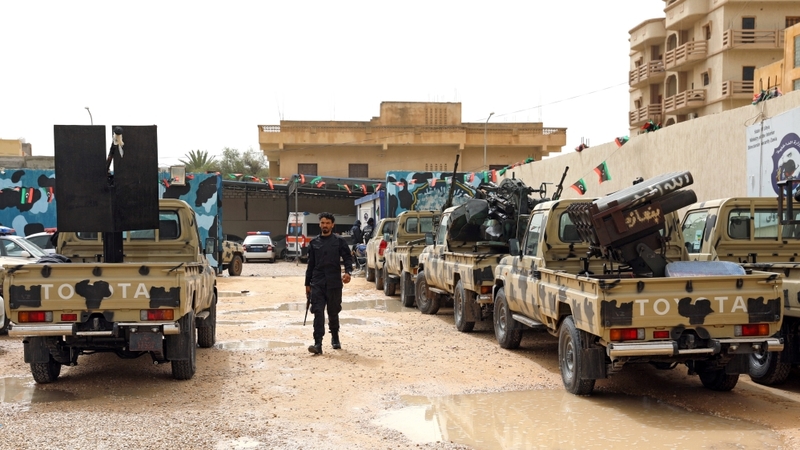 Also on Friday, a militia known as the Joint Tripoli Protection Force based in the area and smaller towns around the Libyan capital announced it would also deploy to repel Haftar’s offensive. “There are reports of confrontations between Haftar’s forces and UN-backed government forces on the outskirts of Gharyan,” Abdelwahed said. Several governments and organisations have urged de-escalation, including those known to be Haftar’s key backers such as France and the United Arab Emirates (UAE). The two countries, along with the UK, Italy and the United States, said in a joint statement on Friday that “military posturing and threats of unilateral action only risk propelling Libya back toward chaos”. Maja Kocijancic, a spokeswoman for the European Commission, said the bloc is “deeply concerned by the military build-up that is underway in Libya and the escalatory rhetoric which seriously risks leading to an uncontrollable confrontation”. Matteo Salvini, Italy’s interior minister, warned that the stability along the southern rim of the Mediterranean Sea was in danger, with Algeria also in turmoil following the uprising against its longtime ailing president. Dmitry Peskov, a spokesman for President Vladimir Putin, denied any support for Haftar and emphasised the need “to avoid actions that would lead to the resumption of bloodshed”.